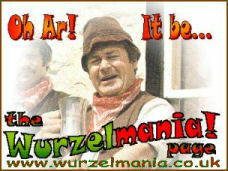 The Wurzels will be appearing at The BAWA Ballroom, Southmead Road, Filton, Bristol supported by impressionist Paul Allen and TV's King of Novelty Mel Mellers on Saturday 2nd March 2002, 8pm-midnight. Also Disco 2001 with Rob Lewis, and compere Mike Lewis. Tickets £9 in advance or £10 at the door (if any left!). Email wurzelfun@aol.com or phone 0117 9612093 or 0798 0037356 for more info, or see www.mikelewisbristol.co.uk. Note that this event has now sold out - sorry! 25th May 2002 Wurzels Back On The Farm! Tickets will cost £8 and there will be a bar "with plenty of scrumpy" (according to the Weston Mercury), food, free parking and a disco. Dress code: wellies optional! The venue is in Wolvershill Road, Banwell, near Weston. Call 01934 822383 for bookings / enquiries. Thanks to Mark Foot for the info on this 'un. 2 June 2002 The Wurzels are playing at the Conygre Hall, Timsbury, on Sunday June 2nd as part of Timsbury's Golden Jubilee celebrations. Tickets will cost £10 and there will be a bar and refreshments. Contact Penny Feeney for more information. 23 June 2002 The Wurzels are appearing at the Midsummer Buzz Festival, Weston-Super-Mare on Sunday 23rd June 2002. See www.prismpromo.com for details. Thanks to Phil Havercroft of Prism Promotions for this 'un. The Wurzels are appearing for the first time at the legendary Pensford Festival, Pensford, Somerset on Saturday 23rd June 2002. Also appearing are Fred Wedlock (who's also compering the show) and of course Pensford's most famous son Acker Bilk and his Paramount Jazz Band. As if that lot weren't enough, there's also the Blue Note Jazz Band from Bristol, with Hannah Wedlock and other support acts. All this for only 11 quid a ticket! See the Pensford Website for details, bookings, etc. LIVE Outdoor Music Stage featuring The Wurzels (on stage at 5.30pm ish). Plus: Funfair, It's A Knockout Tournament, + much, much more!! Near Yatton - entry £5 Directions: Claverham Court Farm, "up against the railway line". Promoted by Mr Atwell 01934 833 193. Starts 6 pm, disco, Wurzels on 10pm - 11.30 or thereabouts. Bar, hogroast, etc., in field and a big shed. Young Farmers promotion / fund raiser. Ta to Woody for the info. Sunday afternoon do. Tickets from PO Box 3273, Bradford on Avon, BA15 2WG. £10 each in advance, cheques payable to Wizzo Productions, enclose a s.a.e. ; or £15 on the door. Doors open 12.30pm. Wurzels on 6pm-ish, ends 8-ish. 2 supports at present (Beatles tribute band, Blues Bros tribute band) & background music etc. Hog roast, beer tent etc. Ta to Woody for the info. 26 July 2002 Friday evening 26th July 2002. The Wurzels are appearing at the Brixham Mardi Gras - this will be at Churston Fields, Brixham Road, Brixham in Devon. The event is to raise money for the charity Action Aid. Tickets are available by email brixhammardigras@btopenworld.com; or by calling 0906 8022011 (calls charged at 60p per minute of which 40p is donated to the charity); or by auction at Ebay. 28 July 2002 Sunday evening 28th July 2002. Wurzels @ Bluebell Railway, East Sussex. See the Bluebell Railway Website for details. Note: Also featuring Fred Wedlock and The Yetties!